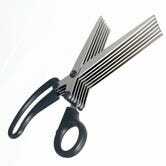 Since the ancient Egyptians who supposedly invented them, scissors have been a constant in human civilization. After knives, they're likely the most common household object the average person owns. Just look around your house: You have them for your nails, your paperwork, your kitchen, sewing—even kids have their own safer versions. So it's odd that we know so little about how they came to be. Here at Gizmodo, we love scissors. So we were curious about how they evolved over the years. What we found was amazing—the following collection of images shows how many forms and surprising types of scissors have emerged since two blades were connected at the handles by a flexible strip of curved metal, three or four thousand years ago. From scissors used on the moon to the battlefield, check them out below. Circa 2nd century: bronze scissors from Trabzon, northeastern Turkey. Chinese silver scissors dated to the Tang Dynasty (618-907). Silver wick-cutter, 17th century. From the collection of the Semmelweis Museum, Budapest, Hungary. More a weapon than a tool: a silver-mounted Indo-Persian scissors Katar. The 7.75-inch scissors, when opened, reveal a single damascus blade underneath. 18th-19th century. Four Ottoman calligrapher's scissors, Turkey, 19th century. Paper scissors, 19th century. From the collection of the Hungarian Theatre Museum and Institute. Ophtalmologic set with three different scissors, mid 19th century. From the collection of the Semmelweis Museum, Budapest, Hungary. Pliers, Lagenbeck's design, 19th century. From the collection of the Semmelweis Museum, Budapest, Hungary. Alpaca umbilicus-nipper in the form of a baby wearing stork, 19th century. From the collection of the Semmelweis Museum, Budapest, Hungary. Three Persian bird shaped scissors, 19th century. Digestive-holder, Collin's design, 19th century. From the collection of the Semmelweis Museum, Budapest, Hungary. Steel pocket scissors, military surgery set, 19th century. From the collection of the Semmelweis Museum, Budapest, Hungary. An electroplated grape scissors, in the shape of crossed square toe irons with mesh patterned gutty golf balls and bats. Circa 1910s. A rare Tiffany Studios bronze Chinese-patterned desk scissors and paper knife, circa 1910, New York. Stainless steel umbilical cord scissors, circa 1950. From the collection of the Semmelweis Museum, Budapest, Hungary. The Apollo 12 Lunar Module Pilot Alan Bean flew and surface-used these stainless steel scissors, manufactured by Weck U.S.A. The pair, from Bean's personal collection, sold for $100,000 at auction. Edwin Cook and his shears. During his 45-year career as a tailor, Cook spent 30 years working with the ecclesiastical tailors, Watts & Co. During this time, he helped create cassocks and robes for most of the world's bishops, dressed royalty and supplied garments for the entire clergy of St Patrick's Cathedral in New York. For animal hair: Sheep shearing scissors. This pair of scissors was used to open the Sydney Harbour Bridge in 1932, and then again to open the new Cross City Tunnel in 2005. These huge scissors were used for a ribbon cutting at a hotel opening in 2009 in Las Vegas. Size matters? U.S. Sen. George Allen and a giant pair of Fiskars ribbon cutting scissors. Fiskars Cuts+More: A pair of scissors that opens bottles, cuts through wire, shreds boxes, pierces holes, and so on. These three scissors, from Fiskars' revolutionary Amplify Shears collection, feature smart technology that adjusts the blades based on the thickness of the material. The Leatherman Raptor multi-functional shears feature the necessary tools for medical professionals in emergency situations. War scissors: An M60A1 Armored Vehicle Launched Bridge (AVLB), deploying its scissor-style bridge in a rugged landscape. Peace scissors: This Ukrainian Tu-160 bomber was eliminated in 2001 by an excavator with a hydraulic pair of scissors attached, under the U.S.-Ukrainian Cooperative Threat Reduction Program. Scissors can be dangerous and even illegal, in some cases. These were confiscated from passengers at Los Angeles International Airport. Scissors as decorative art. Artist Steve Maloney carries his artwork A Traveler's Pile-Up, which is part of a collection called 'Banned Booty' that consists of actual confiscated items at U.S. airport security checkpoints. A nightmarish installation called Scissor Spiders was created by U.S. artist Christopher Locke. The artist made it out of scissors confiscated by security agents at airports. More horror: Scissors inside a human body. And then, of course, there are the cultural touchstones. Like scissors in music.